Karen S. Lynch is Executive Vice President of CVS Health and President of the Aetna Business Unit. 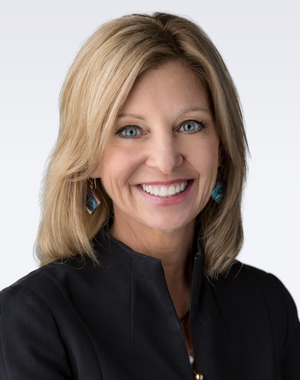 She is responsible for driving the CVS Health strategy to deliver consumer-focused, high-value healthcare to the nearly 45 million people that the Aetna Business Unit serves. Lynch has nearly three decades of experience in the health care industry. Prior to joining CVS Health, she served as President of Aetna overseeing the company’s Government and Commercial businesses. She also held executive positions at Magellan Health Services and Cigna. Lynch began her career with Ernst & Young as a Certified Public Accountant (CPA). For the last three years (2016 – 2018), Lynch was named to Fortune’s list of the 50 Most Powerful Women in Business for her leadership and contributions to improving the health care system. She was also recognized by Modern Healthcare as one of the 2017 Top 25 Women in Healthcare, highlighting her role in transforming health care delivery across the country. Lynch serves as a director of U.S. Bancorp, a trustee of The Bushnell Performing Arts Center, and is a member of the Global 50 and the Boston College Women’s Council. She is a board member of the Aetna Foundation and an advisory board member of IBM Watson Health. She is a past advisory board member of both NEADS/Dogs for Deaf and Disabled Americans and the Boston office of Ernst & Young. Lynch served for three consecutive years as Honorary Chair of the Komen Connecticut Race for the Cure. Lynch has been recognized for her leadership by numerous organizations and publications, including the National Association for Specialty Health Organizations, Business Insurance, the Stevie® Awards for Women in Business, and Insurance Networking News. She has also co-chaired the Health Care and Pharmaceutical Task Force for the Wall Street Journal Women in the Economy Conference. Lynch earned her bachelor's degree in accounting from Boston College and an MBA from Boston University. In 2015, she was presented with an honorary doctorate degree of humane letters from Becker College in Worcester, MA. Follow Lynch on Twitter @KarenLynchAetna and on LinkedIn.